Why Ship to the Czech Republic? What can I send to Czech Republic? What items are restricted? If you’re an experienced hiker and are planning a walking holiday in the Czech Republic to see the country’s spectacular mountain-top views, or if you are going on a skiing trip in the Krkonose Mountains, for example, you will likely want to use your own equipment. Send My Bag can send your skis or hiking equipment to the Czech Republic for you, thus saving you the hassle of carting heavy bags with you, as well as saving you the embarrassment of excess baggage fees. Our courier service is also excellent for students who are moving to the Czech Republic for their studies and want to take daily necessities and home comforts with them. We can send all sorts – clothing, books, DVDs, writing materials, and much more. You can send baggage and boxes to the Czech Republic with Send My Bag, which is an excellent option if you are going on holiday to the Czech Republic and you need to bring lots of clothing or sporting equipment with you. It’s also a great means for students to bring with them all the things they need to set up home in the Czech Republic for a term, a year, or a full degree course. If you send your luggage to the Czech Republic with Send My Bag you can bring many more of your favourite things with you than you could on the plane. To read more about sending luggage to the Czech Republic visit our ‘How it works’ page, or our ‘FAQs’. You can enjoy golfing in the Czech Republic and can choose from around 100 courses, including Casa Serena, Albatross and Royal Marianske Lazne. If you want to sample some of these courses, you can do so using your own clubs by shipping them to the Czech Republic with Send My Bag. This means you can also avoid oversized baggage fees from your airline and avoid having to drag heavy golf clubs onto public transport. Read more about how to send golf clubs with Send My Bag, including how best to package your golf clubs. The Czech Republic is an excellent location for a cycling holiday. It has numerous well-maintained cycling routes for you to enjoy, plus both flat and mountainous regions for you to choose from. You can easily use your own bike, rather than renting one. You can send your bicycle to the Czech Republic with Send My Bag. This is much more practical than checking your bike into the hold of your plane. You will avoid oversized baggage fees and won't have to carry the bike to and from the airport. Your bike will have to be taken apart and securely packaged before being sent to the Czech Republic. Have a look at our information on bike shipping to learn more. The Czech Republic may not be well-known as a ski destination, but it is a real hidden gem, with the initiated enjoying fabulous skiing in resorts such as Pustevny, Jeseníky and Cervenohorské sedlo. Czech resorts pride themselves on catering for beginners, making it a great place to ski for the first time. If the Czech Republic sounds like the right place for your skiing trip, you don’t have to hire skis once you get there. Instead, you can bring your own skis with you by sending them with Send My Bag. This means you will avoid oversized baggage fees and will save yourself the hassle of dragging your skis on to public transport. You can read more on our ski shipping page and find out how to correctly package your skis for transit. If you are thinking about relocating to the Czech Republic to live there permanently, you will have to research international removals to the Czech Republic to take all your things with you. Make sure you go for a reputable removal company and pack everything up well before you hand your items over to the movers. More and more international students are choosing to study in the Czech Republic. The Czech Republic has several good universities to choose from, such as Charles University, Czech Technical University in Prague and Masaryk University. If you are a student moving to the Czech Republic, you will need to bring a lot of things with you, like your course textbooks and many other items, such as fiction books, clothes and DVDs. Shipping your possessions is a handy option, allowing you to quickly set up home in your student accommodation. Find out more about student shipping on our student removals page and find out how to receive your student discount. If you realise you have left some items at home, sending a parcel to the Czech Republic with Send My Bag can be very useful. A friend or family member can put the forgotten items in a box and send them on to you in the Czech Republic. Or, friends could send you care packages and gifts to the Czech Republic. Just make sure they know about any restrictions on sending brand new items (see below). When sending a parcel to the Czech Republic, pick a sturdy box and seal it up well so nothing gets damaged in transit. Find out more about sending a parcel and learn what you can send with Send My Bag and how to package your items. For sending large bulky items you could try air freight. Air freight usually takes about one to two days. This means it is quite a fast service, but it can be quite expensive, especially if you have a particularly large shipment. You will probably also have to pay for the help of a customs agent to handle customs clearance for you, and you will need to find a way to get your items to and from the airport. The price could, therefore, rise quickly. If you send internationally by air freight to the Czech Republic your items will likely arrive at one of the major airports, such as Prague, Brno or Ostrava. Instead of air freight, you could choose sea freight, or container shipping, to shift large items like a fridge or a sofa to the Czech Republic. Since sea freight can take a number of weeks, it is best if you don’t need to receive your items immediately. This option can be cheaper than air freight, but you will still need to pay for the help of a customs agent and will need to arrange how to get your items to and from the ports. As the Czech Republic is a land-locked country, your items will probably arrive at a port in neighbouring Poland or Germany. If you need to ship goods to the Czech Republic, you need to find out about any customs duties and taxes you need to pay, due to your items being brand new and not used personal effects. Also make sure you are aware of what items are restricted and which are completely forbidden from being shipped to the Czech Republic. Thanks for a quick and reliable service! The consignee will be required to provide a copy of their passport along with a copy of their flight ticket showing travel to the Czech Republic from the country they are shipping from, to assist with customs clearance. Customers travelling to Czech Republic for study may also be required to provide proof of study such as an enrolment letter. If the consignee is relocating to the Czech Republic permanently, then evidence of their living arrangements e.g. property lease or rental agreement, or letter from their employer confirming their employment in the Czech Republic may be required. Because most countries allow personal items (known as personal effects) to cross their borders duty free, most Send My Bag shipments worldwide will not be stopped by customs officials. Personal effects are normally considered to be personal possessions that have been owned by the sender for at least six months. If your bag is stopped and checked by Czech customs officials and they find brand new or commercial items, you may be required to pay customs duties and taxes. You should, therefore, be aware of potential customs duties when sending Christmas presents to the Czech Republic. You should follow any advice given by Czech customs and attach all necessary documentation. To indicate that your shipment is made up of personal effects, you will need to complete a short packing list online, with entries to be completed as follows: "2 x Leather Jacket, 5 x Pairs of Socks, 3 x Cotton Shirt", and so on, rather than as "10 x Used Clothing". Customs processes and allowances do vary by country, so we suggest all travellers take 5 minutes to assess how their personal circumstances and what they are sending will be considered under current Czech customs regulations. Food, health and fitness supplements. The Czech Republic, formally part of Czechoslovakia, has a rich and varied history and culture. The country separated from Slovakia in 1993. 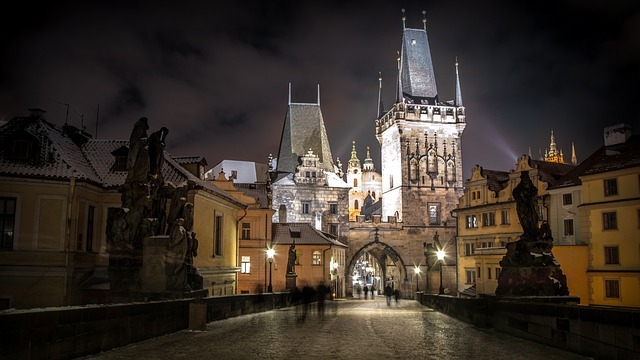 The capital city Prague is a popular destination for long holidays spent exploring its history and culture, and for weekend breaks for hen and stag parties, given its vibrant nightlife and low costs. The countryside of the Czech Republic is renowned for being especially beautiful, with several protected areas and national parks, as well as landmarks, including castles, caves and stunning mountains. Many tourists like to participate in cross-country skiing in the northern resorts during the winter, and hiking in the summer.